Photo by Author of Author’s Backyard – Link back if used, please. 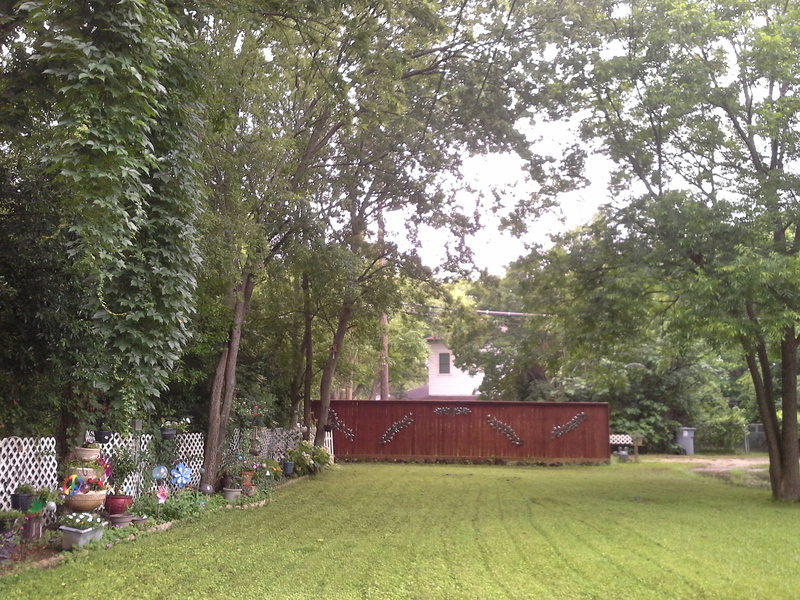 I sit on my deck, overlooking my backyard – a serene sea of green. A lingering essence of the recent rain. I’m in a cocoon of green between the tall trees that surround me – safe in the soft green light. Squirrels scrabble up the pecan tree chasing each other and jump to the twin hackberries woven together. Woven as I am – to this land, this house, this life. While wind chimes softly announce the coming dusk. The evening’s diversions have yet to begin. Noticing everything is verdant and fragrant – everything is so alive. A wild bunny appears, munching in the tall grass, nearly invisible and so small and vulnerable. Suddenly, a red-tailed hawk flies into the garden, magnificent striped feathers splayed out for my view! Alighting on a short shepherd’s hook, the predator turns and just as suddenly flies straight toward me! The bunny scampers to safety under the deck at my feet as the hawk swoops so close my heart nearly stops! Thankfully, the hunter is empty-handed and chased from the yard by two very loud blue jays! I realize my sanctuary is home but also a dangerous place for some. Like the hidden dangers in every lived life – uncertainty and destruction are always near. Blowing the scent of the oak-leaved hydrangeas to my hungry nose. Flowers explode in color, now that the harsh sun has fallen behind the trees. Martins circle high overhead, joy-riding on the upsweep thermal winds. Shadows lengthen at the edges, painting the bushes a deeper shade of green. Faeries begin emerging, their clothes the color of May – as invisible and present as the bunny. My heart sings with the wonder of it all, so full of gratitude. Soft lights in the dark at the edges, traveling stars in the gloaming. The sky has turned a gentle shade of pink, illuminating the darkened trees as if they were on display. Unbidden, my ancestors and dear ones send me overwhelming love in return. All around me is love – my backyard is a river of love. Hear it in the land singing in trees. Who am I to receive such riches?